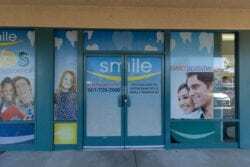 Smile Dental Group offers comprehensive orthodontic care for patients of all ages in the Antelope Valley, which includes a full evaluation of the entire occlusal system. We look for any signs of dysfunction in the bite, teeth, and jaw, and build a personalized treatment plan for dependent on the needs of our patients. An individualized orthodontic plan can be implemented to address bite problems, malocclusion, and a variety of dental concerns affecting the development, function, and appearance of the natural teeth. We offer a complete range of orthodontic services for children, teens, and adults in the comfort of our Antelope Valley dentist office. After a full assessment of you or your child’s needs, we can build a treatment plan tailored to meet your unique needs. Space Maintainer: When a primary tooth is lost prematurely, a space maintainer may be implemented to help maintain the space. If a space maintainer is not installed, the remaining teeth may shift or drift, preventing the new permanent tooth from erupting. Guided Eruption: Teeth overcrowding can be prevented using a guided eruption technique. After a full evaluation, our team will determine if this method is right for your child’s smile. Early Extraction: When primary teeth do not fall out on their own, an early extraction may be deemed necessary to help make room for the eruption of the permanent teeth. Thumb Sucking: Thumb sucking can lead to teeth development issues and can even lead to an overbite that requires complex orthodontic treatment. We may recommend an appliance to help reduce thumb sucking and foster a healthier smile. Dental Headgear: Dental headgear may be implemented to correct the fit of the upper and lower molars as well as create additional space for the permanent teeth. Two-Phase orthodontic treatment is often implemented to address physical and facial development over an elongated period. During the first stage, the teeth are evaluated, and a treatment plan is established. During the first phase of treatment, we may recommend the use of certain orthodontic appliances to help foster a healthy space for the emergence of the permanent teeth. After this stage is completed, the patient enters a “resting period” in which the permanent teeth are allowed to emerge. Once the permanent teeth have erupted, patients may need braces. After the braces are worn for the recommended amount of time, patients will receive a custom retained to reduce the risk of their teeth shifting. After both phases of treatment, the teeth function as they should and create a beautiful, healthy-looking smile. To learn more about two-phase treatment, visit your experienced dentists at Smile Dental Group. Orthodontics is not just geared toward children. Adults can receive the orthodontic care they need to improve the health, function, and appearance of their smile. Crooked or misaligned teeth can often lead to an increased risk of tooth decay and cavities. Orthodontic issues can also cause patients to feel self-conscious about their smile, which can make social situations uncomfortable. Addressing your orthodontic concerns is the best way to improve your smile. We offer a full range of orthodontics for adults in our three Antelope Valley dentist office locations. For patients seeking a more discreet solution to their orthodontic concerns, we offer Invisalign. Invisalign utilizes several clear, removable aligners that help gradually shift the teeth into proper alignment. If you would like to learn more about your treatment options, you can visit our dental office for a consultation. There is a wide range of brace options for patients with various orthodontic concerns. 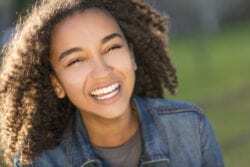 The type of braces patients need will depend on the severity of their condition, their overall dental health, budget, lifestyle, and preference. Ceramic Braces: The brackets are created using dental ceramic instead of metal. This type of brace is ideal for adults who want an alternative to traditional metal braces. Metal Braces: Metal braces are the most common type of orthodontic treatment. They are ideal for patients of all ages and can be used to address a wide range of orthodontic issues. Invisalign: Invisalign is one of the most popular types of orthodontic treatments and is ideal for both teen and adult patients. Invisalign uses a series of clear, removable aligners that help gradually shift the teeth into proper alignment. To learn more about orthodontic treatment for you or your child, visit our team at Smile Dental Group. We can work with you and your family to find the best solutions for your smiles. 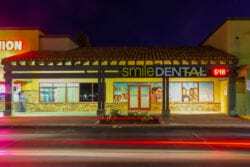 To schedule an appointment, contact one of our three Antelope Valley dental offices or request an appointment online.